Westbury Primary School enjoying traditional maypole dancing in front of an appreciative audience on the Village Green. 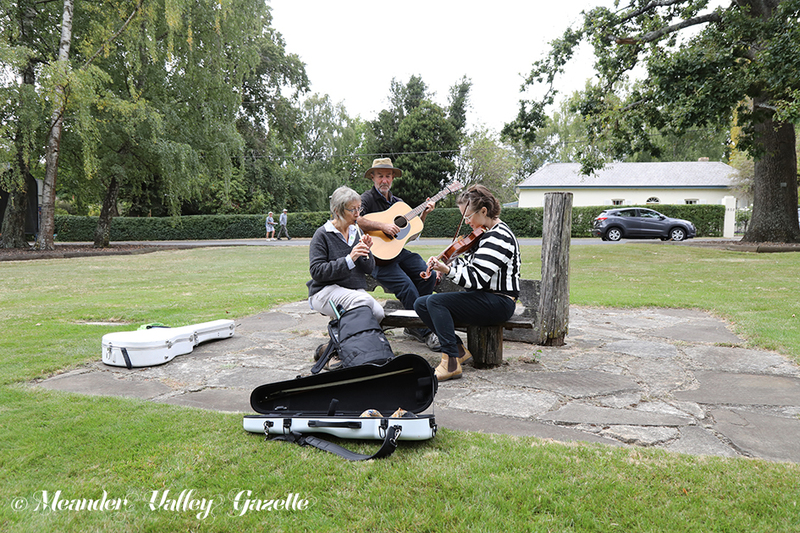 ‘The Wheels’, John and Kathy Hickey of Hobart and Lou Barber of Launceston, warm up before their performance on stage. UNDER THE leafy spread of trees, the Village Green provided a cool, green backdrop for a day of music, dancing and singing at the 2019 St Patrick’s Day Festival. Rehearsing or performing on the stage, or around the maypole, local children and artists from near and far created a pleasant soundtrack for the day’s activities. Halfway to Forth band members Dan and Kyle Lizotte will perform their signature blues and roots at the Little Laneway Fringe Festival. TWO HUGE NW Coast bands will lead a line-up of talent from the greater Deloraine area in the Little Laneway Fringe Festival on the weekend starting 26th April. The entertainment in the laneway between the Empire Hotel and Seppenfelts coincides with the national square dancing convention in town on the same weekend – and Seppenfelts’ 10th birthday. The Sheyana Band, which last year won the 2018 Chris Wilson Award for Emerging Act of the Year, perform on from 4 til 5pm followed by a local drumming circle jam. Local musicians will perform alongside the two big bands, giving talented locals without a platform the opportunity to play in public. Performance organiser Kat Jeffree said performers include Scotty O’Leary, Shani Saint Albans and choir members, Andi (from Deloraine’s Shandi shop), Eddie Tuleja, Sheridan (from the Empire Hotel) and Canadian guitarist Tristan. Janis Chaberka returns to LLFF this year, collaborating with a friend to perform folk music. Poet Yvonne Gluyas will bring eight performance poets from Launceston. Kat Jeffree said classy burlesque dancer Miss Jessie G will once again perform her G-rated five-minute act where she removes her vintage-style outfits – creatively. “It’s a weekend where musicians come out of the hills and into the town.” “People should drop in any time – it’s a free opportunity to see the creativity our area has to offer,” Kat said. The Little Laneway Fringe Festival is Friday 26th April, 6.00–10.00pm; Saturday 27th, 1.00–10.00pm; Sunday 28th, 1.00–6.00pm. See FB closer to the event for specific time details. 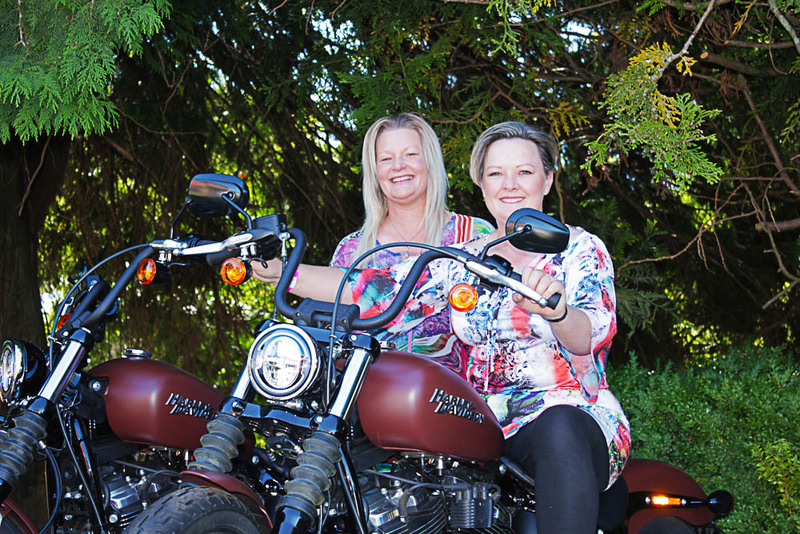 L to R: Ange Weeks and Dee Lowry of Sheffeld testing brand new Harley Davidson Softails which were showcased at Mole Creek. MUSIC FESTIVAL goers went Radio Ga Ga at Mole Creek on Saturday 23rd February for the 2019 Day at the Creek. The town was a ‘hive’ of activity as a helicopter ferried joy flights overhead, visitors strolled along Pioneer Drive for coffee and the morning papers, and two brand new Harley Davidson Softails arrived to be showcased for the raffle. Mole Creek Hotel owners, Doug and Ramona Westbrook have tapped into Tasmania’s Crazy Little Thing Called Love for tribute bands. They re-booked Killer Queen Experience to return as headliners after their performance at the 2018 Day at the Creek, along with Credence Clearwater Revival, Bowie and Elvis tribute acts – perfect for those who have not “experienced” the real artists or for people who just want to relive memories from the 70’s and 80’s. Modern-era audiences of all ages can’t get enough of Queen, whose iconic hits are enjoying a world-wide resurgence following the 2018 release of 20th Century Fox’s Bohemian Rhapsody. The British rock band and lead singer Adam Lambert officially opened the 2019 telecast of the Academy Awards. Chair of Australian Rotary Health Tasmania, John Dare said the hoteliers have always donated to local organisations, but decided for the first time this year they wanted to raffle two identical Harleys, with all funds raised ($45,000) to go to Australian Rotary Health for research into Youth Suicide and Mental Health. Rotary District Governor of Tasmania, Ross Carlyle presented Doug and Ramona with the Paul Harris Fellow recognition at the event for their support. The Harleys were won by Luke McDonald and Woodrow Barstad. 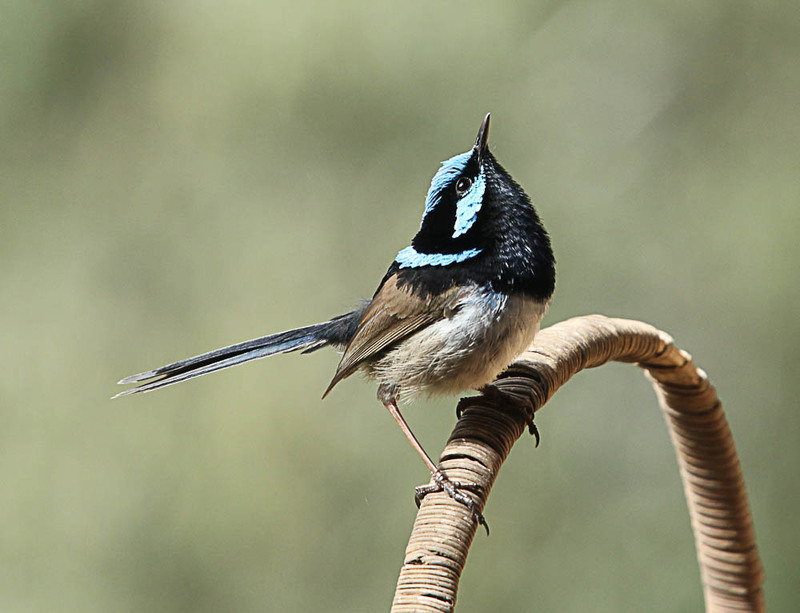 A selection of Sarah Lloyd’s bird photographs will be on show at the Meander Valley Council oces in Westbury and Pixels Digital Gallery in Deloraine until the end of March. TASMANIA HAS a special bird fauna, with many species found nowhere else. Some, the Tasmanian Native-hen, the Black Currawong and the largest honeyeater in Australia, the Yellow Wattlebird, are conspicuous. But others are easily overlooked - Scrubtits, Tasmanian Thornbills and Tasmanian Scrubwrens are cryptic birds of wetter habitats; the endemic honeyeaters (Yellow-throated, Strongbilled and Black-headed) forage high in the canopy of eucalypts and rarely descend to the understorey; and the tiny, leaf-sized Forty-spotted Pardalote is now only found in the woodlands of the south and south-east. In the past two hundred years the Tasmanian landscape has changed irrevocably and there is no doubt that this has been disastrous for birds. Cities and towns are encroaching on bushland; agricultural activities, once restricted to the most fertile soils, are expanding and intensifying and native forests are being decimated to feed our voracious appetite for timber products. A wave of bird declines and extinctions is sweeping the planet and island populations are the most vulnerable. Their inherently small size, vulnerability to habitat modification, fragmentation and introduced predators, especially cats and rats, and the changing climate are taking their toll. Birds are part of our everyday lives; we are captivated by their antics, beautiful colours and melodious songs. They have crucial ecological roles in controlling insect populations, pollinating plants and dispersing seeds. Birds have an intrinsic right to exist; we can all play a part in ensuring they do. THE DELORAINE Street Car Show gets bigger every year. The number of cars grows and the number of visitors coming through increases, benefitting local businesses and giving people a rare glimpse of motoring history. For those wanting some extra fun, the show offered a Car Cruise and Mystery Garage visit the day before. Those interested started at the 50’s Diner in Deloraine and then went on a cruise to a surprise garage to see someone’s prized collection. Committee Member, Carl Mansfield, led the convoy to their mystery destination, a different one each year. “There were one hundred cars on the cruise this year. The line went for kilometres as we made the journey,” he said. An estimated 500 cars were on display at the car show this year, and they were met with perfect weather. Funds raised by the event are put back into the community through various organisations. “We will give more away during the year when we decide where it’s needed the most,” Mr Mansfield said. The Deloraine Car Show was an idea of a group of local businessmen including Carl, who wanted to bring business to Deloraine. A magnificent muscle car visits Deloraine for the annual Deloraine Street Car Show. TO MOST people, yoga conjures up visions of chanting, sweaty bodies and limbs contorted into poses such as Downward Facing Dog, Reclined Cow Face and, of course, the Eight-point Shoulder Opener. However, laughter yoga bears no resemblance to traditional yoga besides shared health benefits and a Hindu form of cultural greeting and/or parting from Sanskrit known as Namaste: “I bow to the divine in you”. Attuned Vitality owner, Debby Kemsley describes her Laughter Yoga Club as “exercise for the soul” – designed to drive the stale air from your lungs, while creating a favourable environment for the happy, feel-good hormones - endorphins. Each 30 minute session features alternating sequences of laughter and breathing exercises, repeated over five rounds, followed by a pause at the end of each sequence. “Laughing can increase the body’s endorphin levels to create a more positive attitude and generate a lot of energy. It can also lower the stress hormone cortisol, which can make people feel tired and unenergetic, without them even realising why,” Debby said. Laughter Yoga Club will be at Deloraine House starting on 13th March, Wednesdays 9.00am for a 9.15am start. It’s free. Private and extra sessions also available. Contact Debby Kemsley: 0477 772 739. 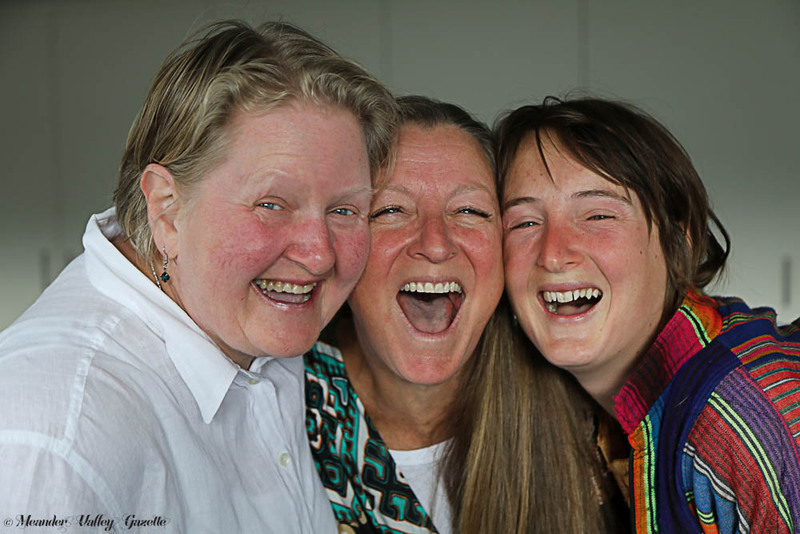 From L-R Brenda Greichen, Debby Kemsley and Jilli Porter-Bains, all practice laughing yoga on a regular basis. The Westbury St Patrick’s Day Festival will be held on the Village Green Saturday 16th March from 10.00am, entry by donation. WESTBURY WILL be green in March with a family festival to coincide with Saint Patricks Day. After last year’s festival was cancelled due to planning problems, the committee has made sure 2019 will go ahead on the 16th March. Secretary Amanda Taylor expressed how the annual festival comes about to celebrate Westbury’s Irish heritage. “We want it to be a family friendly festival. There will be local performers as we celebrate Westbury’s history. “It was settled by many Irish immigrants and convicts such as Richard Dry”, she said. Westbury in the 1820s was a garrison village. The first settlers were mainly Irish ex-convicts, retired soldiers and free settlers. By 1850 it was the largest military community in Tasmania. Richard Dry was the largest landowner in Westbury. An ex-convict through political exile, he helped many Irish people set up in Westbury. His son became the first nativeborn Premier of Tasmania. The festival will be at the Westbury Village Green from 10.00am - 4.00pm. Entry will be by donation. A WEEKLY hospital visit is only one of the many activities members have undertaken over many years as volunteers with the Deloraine Branch of the Australian Red Cross. 100 people attended the annual fund raiser, a Devonshire Tea and raffle, held on the 31st January this year. This raised $2,279, which President Lexie Young said would go towards charities throughout Tasmania, including bush fire relief. During the event, two members were honoured for their long service to the Red Cross. The Northern Regional manager, Barbra Hill and the volunteer mobilisation coordinator Pippa French presented Joan Pedley with a gilt rosette for 60 years of service and Marilyn Day received an award for 50 years of service. A remarkable achievement. L to R: Joan Pedley, Marilyn Day and Lexie Young of Deloraine Red Cross. The new research coincides with thousands of volunteers hitting the streets for March’s Red Cross Calling Appeal. Every March, Red Cross Calling brings volunteers together to host events, knock on doors or donate to Red Cross Calling. EVER WANTED to learn a language? All you need is your library card. Come along to the Deloraine Online Access Centre on Tuesday 26th March at 10.00am to 11.30am and discover how your library card provides access to Mango Languages and the opportunity to learn 70+ languages. It’s great for travellers, business people or for anyone who loves learning new things. Who knows, you might be able to watch those foreign without the subtitles! Participants can come, hear and look or they can use a computer and enrol. Bring your current Libraries Tasmania card & password (if you haven’t used your Library card in awhile, drop into the Library to update it & your password) and also bring an email address you can access at the centre. This session is provided free of charge and morning tea will be provided, but please book a spot first by calling the Online Centre on 6362 3537. A COUPLE of events coming up in Ulverstone may be of interest to residents of Meander Valley. The first is a Mental Health and WellBeing Workshop for people 65+. Participants will be presented with the latest Australian and Tasmanian research finding on what is known to be important and meaningful to people, especially Tasmania. Local priorities will be identified and local opportunities explored. Free workshop 9:30am through to 2:30pm. Catering is provided. Register at www.eventbrite. com/e/people-65-mental-health-wellbeing-workshop-tickets-53943495447 or call Roslyn Evenett 6421 3618 for more information. The second is Back to the Future. Ulverstone’s North West Ecofest is being held on April 13th, 2019 – 10.00am to 4.00pm. The theme is Back to the Future: where the Wisdom of the past meets the innovation of the future. Entry to the festival is by gold coin donation. The festival offers an opportunity to engage with some local community groups, businesses and individuals who are willing to share expertise in the areas of sustainability, wellbeing and the environment. Stalls, workshops and talks as well as food, buskers and children’s activities will complete the experience. Special guest is Tasmania’s very own “Food Guru” and Senior Citizen of the Year, Sally Wise. Bring your old batteries, mobiles, spectacles to be recycled. Cycle, walk, car share and don’t forget your own water bottle. Contact Anne 0407 614 985. THE LIONS Club of Hadspen South Esk is co-hosting with City of Launceston Lions the LAUNCESTON MS 24 Hour Mega Swim 2019. The event will be held on Saturday 18th May & Sunday 19th May at the Launceston Leisure and Aquatic Centre. The MS 24 Hour Mega Swim is a fun team relay event where teams have a swimmer in the water for the entire 24 hours and compete for laps swum and money raised. It is one of Australia’s most popular and fastest-growing fundraising events, bringing communities together in support of people living with multiple sclerosis. Launceston raised over $20,000, with 5 teams and 60 participants in 2017 with great community support. This year the event is hoping to raise another $20,000. Over fifteen MS 24 Hour Mega Swim events take place across ACT, NSW, TAS and VIC each year, hosting family-friendly, all ages events. In 2018, nearly 3,000 participants swam over 400 hours across Australia, raising over $850,000 to support people living with multiple sclerosis. Events are organised by local committees with support from MS.
Now in its 18th year of the event, the MS 24 Hour Mega Swim was originated by Carol Cooke AM, an Australian Paralympian living with MS who had a vision of bringing people together to raise funds for multiple sclerosis. Multiple sclerosis is the most common neurological disease in young adults and diagnosis is typically between 20 and 40 years of age, although onset of symptoms may be earlier. Funds raised go to people living with multiple sclerosis by funding the Go for Gold Scholarship Program and Financial Assistance Programs. Go for Gold Scholarships allow people living with multiple sclerosis to reach their potential in life. They provide direct and immediate support for some of the 25,600 Australians living with multiple sclerosis. To donate or sign up go to megaswim@ms.org.au or you can call 1300 733 690. EVERY MARCH, multiple birth associations around Australia celebrate Multiple Birth Awareness Week to highlight both the challenges and successes faced by families with twins, triplets or more. Katie White, mum to four-year-old Sienna and two-year-old twins Lewis and Elliott, found her experience with the boys completely different to that of her daughter. Difficulties throughout her pregnancy increased her anxiety and worry for the health and wellbeing of her babies, while hospital stays and doctor-ordered bed rest meant time away from Sienna. The boys were born prematurely and required weeks in hospital before they could go home. Katie found trying to care for babies in hospital and a toddler at home was overwhelming and difficult. “The worry about what would happen if both boys were unsettled at once or needing feeding at the same time, or the worry about fitting the twin pram in places prevented me from going to things I normally would have,” she said. However, she met a group of twin mums through the Tasmanian Multiple Birth Association (TasMBA) and found these catch-ups helped to build her confidence. TasMBA is a not-for-profit organisation run by volunteer multiple birth families. The organisation provides support, resources and education to multiple birth families around the state. All multiple birth families, no matter the age of their children, are encouraged to connect with others in the Tasmanian multiples community whether at playgroup, quiz nights, school holiday catch ups, BBQs, information sessions or one of the other regular events organised by TasMBA. Check out the TasMBA Facebook page for more information and updates. A FAMILY information and support session on an introduction to dementia, causes, symptoms and typical changes that may occur, was held in February at Deloraine House. Also discussed was the availability of support services in northern Tasmania and Dementia Friendly Communities. Ms Kim Curley, a Dementia Advisor based in Launceston, told of an estimated four hundred and thirty-six thousand Australians living with dementia. This not only impacts on individuals with the condition but also family and friends who provide support and care. The word Dementia is the umbrella term used to describe a collection of symptoms which cause changes in memory, thinking and behaviour of the brain. Services provided by the Tasmanian Division of Dementia Australia include counselling with practical and emotional support, education and training to increase understanding and awareness, and living with memory loss programs. As a family member, friend, neighbour or co-worker you can increase your awareness of the impacts caused by dementia and make a person coping with dementia feel accepted, safe, included and involved. Further details about dementia friendly communities can be found at www.dementiafriendly.org.au. The national helpline, 1800 100 500, is a free and confidential service where you can chat with caring and experienced professionals about dementia and memory loss concerns you may have for yourself or others. The Launceston branch of Dementia Australia can discuss aspects of care regarding diagnosis and treatment. To contact Kim Curley phone 6325 4688 or email Kim.Curley@dementia.org.au. ON A wet summer’s morning in early February, well-known resident, artist and musician Joanne Mitchelson married her violinist friend and soul mate Hamish Pike in the Anglican Church at Westbury. The beautiful and historic church was a fitting setting for 5 harpists who had accompanied Joanne on trips to Northern France for festivals and performances, plus there was a violinist and organists which also helped fill the air with music. The church was packed with guests and well wishers and as they emerged, the sun shone on this most exceptional couple to wish them well. Hamish looked special in his waistcoat and was supported by longtime friend Peter McPhie, Joanne’s brother Brian and one other Mitchelson together with 3 page boys in bowties. Joanne wore a slim fitting cream lace dress with flowers in her hair and a long train and was attended by bridesmaids in dark blue together with some simply gorgeous flowers girls. The wedding reception was to have been on the historic village green opposite the church where she and Hamish met some years previously, but as the ground was sodden the organisers made a rapid transition to the Westbus Depot, setting up tables for the feast provided by locals and guests to make this day a very special day for a very special couple as they embark on a new journey together. ON THE 16th January, a commemorative morning tea for Mrs Helen Horton was held at the RSL Club in Deloraine. Mrs Helen Clayton thanked the 80 people in attendance for coming along to help celebrate the life of the well-respected member of the Deloraine community. Helen and her husband, Don, were remembered for holding the first Cancer Council Biggest Morning Tea at their home in Deloraine and Helen continued to coordinate the event for the next twenty years. As well as being a member of the Deloraine Hospital Auxiliary and Meals on Wheels for a number of years, she was also a fundraiser for Sudden Infant Death Syndrome (SIDS). Four of Helen’s grandchildren reminisced about their time spent with Helen and Don while growing up. She was a great cook, they said. Mrs Helen Horton passed away on the 3rd January 2019 after a long illness. WHO WOULD have thought that cow poop could be worth money? Get along to the Chudleigh Show on Saturday the 16th February to find out how. The Junior Beef Expo committee are holding the first ever cow poo lotto. A novel approach to fund-raising, it works by marking out a paddock with grid lines and numbering the resulting squares. Competitors purchase a square or squares in the grid and a cow is then let into the gridded paddock. Here’s where it gets intense with every one waiting and watching to see which square the cow poops on as this will be the winner. Chudleigh Show has been running since 1889, 130 years. or children there will be a jumping castle, pony and train rides. The committee are also hoping to hold a kids fishing event. Entry is $10.00 for adults; $20.00 for a family of four (2 adults, 2 children). The good folk of Chudleigh organised another circus skills workshop for thirty lucky Meander Valley young ones during the school holidays. Pictured here are L-R Cayden Kester, Shenoah Hume and Samuel Marshman, all 8yrs, practising with kangaroo stilts while ably assisted by Kim Hume. FARMERS ARE important to the booming economics of Meander Valley. Yet, for their neighbours or people moving near to farms, some may not understand their rights and responsibilities. A new campaign by the Tasmanian Farmers and Graziers Association (TFGA) called ‘Living next door to a farmer’ hopes to change that and help build good relationships between farmers and their neighbours. A $100,000 boost to the TFGA by the Government over three years aims to improve neighbours’ understandings of farming activities and clearly outline everyone’s rights and responsibilities. This campaign is part of the Agrifood Plan enacted by the Department of Primary Industries, Parks, Water and Environment which aims to build the state-wide value of agriculture to $10 billion per year by 2050. It will do that by helping farmers be competitive and give them certainty and the confidence to get on with business. AGED CARE Deloraine Auxiliary are holding a Launceston Cup day Fundraiser. It will be a Black and White luncheon held at the Deloraine RSL club on Wednesday 27th Feb 2019. Cost is $25.00 per head which includes a 2 course meal. Complimentary wine or orange juice on arrival. Consult your milliner as there is a prize for the best hat as well as a raffle, sweeps and lucky door prizes. RSVP Chris Chilcott 0419 575 193, Maureen Hoskin 6362 4924, Jan Atkins 6362 2892 or Pauline Grey 6367 8217.